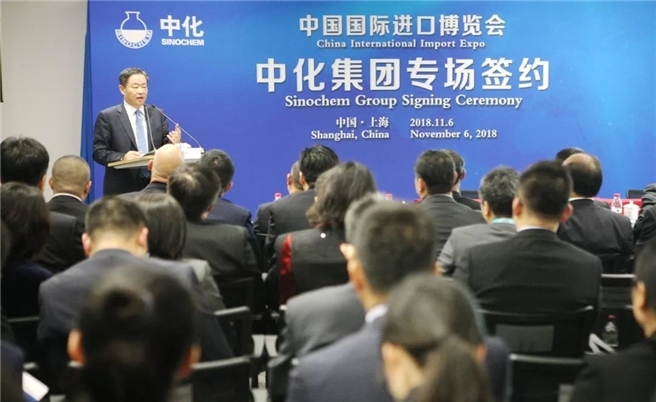 On November 6, Sinochem Group held a special signing ceremony in the venue of the 1st China International Import Expo (CIIE), and announced its transaction fruits harvested from the grand CIIE. On the site, Sinochem Group signed purchasing agreements with 17 foreign companies to import 19 kinds of commodities (mainly crude oil, high-quality fertilizers and high-end chemicals), with total purchasing amount of more than USD 11.3billion. Mr. Frank Ning, Chairman of Sinochem Group, commented at the signing ceremony: “The 1st CIIE is an important event to promote trade liberalization and economic globalization and boost the global economy. It is also an important platform for Sinochem Group to further achieve market access, join hands with economic and trade partners, and further gain ground in cooperation scope and cooperation effort. Looking ahead, Sinochem Group will adhere to the core value of “In Science We Trust” and strive to involve into an innovative enterprise driven by science and technology within 5 to 10 years. Sinochem Group aims to become a respectable industrial leader and world-class enterprise, create the maximum value for our clients, shareholders and employees, and promote sustainable development of our society. Sinochem Group expects to give impetus to its own industrial upgrading through more unimpeded trade and introduction of high-quality products with higher technology content. We are willing to ensure reciprocity and mutual benefit, achieve joint development and promote the prosperity of the world economy through trade with its partners and all other enterprises around the globe”. Commodities, purchased by Sinochem Group at the 1st CIIE, fall into such categories as crude oil, resin, fatty acid, polyurethane, potash fertilizer, phosphate fertilizer, compound fertilizer, water-soluble fertilizer, sulfur, soil conditioner, cocoa bean, jute, menthol, etc. These commodities are produced in 17 countries and regions, including the United States, Mexico, Russia, France, Norway, Australia, Saudi Arabia, Kuwait, Israel, Egypt, Jordan, South Korea, India, Bangladesh, Indonesia, the Philippines, and China Taiwan. According to Mr. Zhang Wei, President of Sinochem Group, by importing high-quality raw materials, Sinochem Group will meet the production needs on its own, ultimately produce high-quality products, promote the industry-wide advancements, and satisfy the people’s needs for a better life. All partners attending signing ceremony are well-known multinationals, such as Saudi Arabian Oil Company, Kuwait Petroleum Corporation, Arab Potash Company, Mosaic Fertilizers (Hong Kong) Limited, Uralkali Trading SIA, Trammo, Inc., BHP Billiton Marketing, Inc., YARA Asia PTE. LTD., Gat Fertilizers Ltd., Daesung GM-Tech Co., Ltd., CHI MEI Corporation, The Dow Chemical Company, PERMATA HIJAU, SUCRES ET DENREES SA, NAMFA TRADE INT’L, Sharp Mint Ltd. and AgriNature, Inc. Mr. Jamal Al Sarayrah, Chairman of Arab Potash Company, will deliver a keynote speech at the signing ceremony.